Laboratory safety training in many academic programs is restricted to a short introduction to laboratory rules and safety equipment on the first day of laboratory work. Very often, there are few additional safety resources beyond a Chemical Hygiene Plan binder or a generic safety handout. Student comprehension and respect for safety suffers as a result. This presentation will explore how the application of rather simple techniques can inculcate the "culture of safety" that students need to work safely and proceed professionally. Laboratory and chemical safety training is a familiar ritual on the first day of many laboratory courses. Students are given a handout that lists general safety rules and they stare at it glassy-eyed while the instructor quickly runs through the list. Students may even be required to complete a short safety quiz or watch an entertainingly ancient video. Once these formalities are dispensed with, the students are told to "get started" on their work. Safety is rarely mentioned again unless a student encounters or creates a particularly hazardous situation. Alas, safety is neither a simple prerequisite nor an ancillary part of laboratory work, but an integral and permeating component of everything a chemist or engineer does. When students leave the academic world, they quickly run up against very rigorous and radically different safety expectations in the professional workplace. Behaviors and sloppy habits that were overlooked in the academic setting can be grounds for immediate termination in The Real World. The transition from the relatively lax safety attitudes of academe to the culture of safety found in industry can be difficult and surprising to both recent graduates and their workplace supervisors. Useful resource: "Teaching Safety in High Schools, Colleges, and Universities, Fall 2002 CONFCHEM. Affords insights and innvoations into contemporary safety training. It is abundantly clear from anecdotal evidence that industry would prefer our higher educational institutions to turn out graduates who possess a greater awareness of safety culture and the integral role it plays in the chemistry profession. For example, many companies have adopted formal programs such as DuPont's STOP™ , a top-down and job-focused interactive approach to that helps employees think about safety, allowing it to be integrated into their everyday work activities. Such approaches are exceedingly rare in academia. There are many factors influencing this academia-industry disconnect - fitting material into a crowded course, lack of support from colleagues or administrators, fragmented course sequences, lack of time or resources to develop integrated safety lessons etc. Compartmentalization has a significant impact as well. For example, a paper discussing exploratory and inquiry-based safety training falls on the peripheries of both the ACS Divisions of Chemical Health and Safety andChemical Education. Safety is the ultimate interdisciplinary chemistry subject, but does not carry the panache or cachet of "the latest innovation" (nanotechnology, Green Chemistry etc.) in either, or for that matter, any, sub-field of chemistry. In this paper we will discuss an inquiry-based learning approach that not only teaches safety as an integral part of every chemical activity, but also empowers students to seek out safety resources on their own. This collaboration between the University of Arkansas at Little Rock (UALR, Belford) and Interactive Learning Paradigms Inc. (ILPI, Toreki) integrated the web-based MSDS HyperGlossary and MS-Demystifier into two different classes, a Fall 2005 Independent Study Course on Chemical Hygienics and a Spring 2006 Second semester general chemistry laboratory. The latter project demonstrates that our approach can be readily implemented in at other universities because the necessary pedagogical materials are freely available on the Internet. and the barriers to implementation are minimal. The MSDS HyperGlossary (MSHG) is a free, hypertextual web-based resource that discusses well over 500 terms typically found on Material Safety Data Sheets (MSDS's) as well as other common laboratory health and safety documents. Each entry in the MSHG offers a concise definition of the term(s), the specific relevance to MSDS's, additional information that users of all backgrounds can easily comprehend, and authoritative external links for further information. A typical entry is shown in Figure 1. Figure 1. Annotated screen shot of the an MSDS HyperGlossary entry (click on the picture to view the actual MSHG entry). In this example, the textual content was created by UALR students and then submitted for review prior to posting. View a larger version of this figure. The ILPI domain that hosts the MSHG is considered an "important" authority by Google's proprietary Page Rank system, resulting in extremely high rankings when MSDS-related terms are searched at Google (Table I). As a result, there are well over 500,000 page views within our MSDS resources (More Info) each month from 200,000+ unique IP addresses. are top-10 matches at Google. The MSDS site's traffic and imprimatur are worth mention because they inspire considerable visitor feedback. With a daily audience of tens of thousands of viewers, errors are quickly caught and corrected. This gives the MSHG the power of a wiki without the attendant mayhem that the open editing of a resource such as Wikipedia can encounter. o For a discussion of a wiki approach to collaborative content management see paper 5B of this conference, "The Science of Spectroscopy: Collaborative curriculum development using a wiki". o For a discussion of wiki-based course adjuncts, see paper 8C of this conference, "Expanding the role of the organic chemistry teacher through podcasting, screencasting, blogs, wikis and games". As the MSHG is both highly successful and advertising-supported, there is a sustantial financial incentive for ILPI to maintain and expand the content (More Info). In contrast, many course-specific academic web sites suffer from neglect when a teacher is in the off-semester or incur (or become themselves) broken links when the instructor no longer has responsibility for the course. The issues of broken links and stale content was discussed during Paper 7B and others of the current (Spring 2006) CONFCHEM conference. 4. The pedagogical writing style, designed to be approachable to a worldwide audience regardless of educational background. 5. Succinct placement of pertinent information into sections, helping the visitor to parse (or ignore) the material of their choosing. 6. Extensive but judicious use of hyperlinks, cross-linked within the resource (More Info), other pertinent pages in the ILPI domain (More Info), and to pertinent external authorities. The crown jewel of the MSHG is the MS-Demystifier, a web page on which visitors can paste their Material Safety Data Sheets (MSDS's) or any other document and have every technical term converted into a hyperlink to the corresponding entry in the MSHG. Thus, one can simply click on the word "diaphoresis", "PEL-TLV", "NIOSH", "engineering controls", or 500 hundred other terms and immediately find out more about them in the specific context of MSDS's and safety. Figure 2 shows an example of an MSDS before and after it has been demystified. Avoid heat, flames, sparks and other sources of ignition. May ignite or Explode on contact with Combustiblematerials. Figure 2. An example of MSDS content before and after being run through the MS-Demystifier. Every hyperlink in the After column puts the user one click away from a clear, understandable definition in theMSDS HyperGlossary. Using the MS-Demystifier, one can convert a Chemical Hygiene Plan into a hyperlinked document that provides immediate comprehension of any technical term or obscure acronym. Students reading MSDS's for their laboratory experiments will no longer need an advanced degree in science or occupational safety to understand the content. Students who are weak on elementary topics in chemistry or safety can immediately refresh their memories. One clicks, grasps the term, and is then back to business. With less confusion about basics, the student can actually enjoy the course rather than being frustrated by it. Likewise, the MS-Demystifier can be quickly used to populate a course's web site with hyperlinks to the MSHG, enabling instructors anywhere to leverage its power with a minimum of effort. The second half of this paper discusses the implementation and integration of these resources into the chemistry curriculum at UALR. We began the UALR-ILPI collaboration in 2005 with the intent of integrating the MSHG into General Chemistry laboratory course materials. The most immediate challenge this posed is that the MSHG, while expansive, does not encompass every conceivable MSDS or chemistry term. In fact, at the time, we (ILPI) had a backlog of about three dozen terms that readers had asked us to add, but that we had not had time/incentive to author (More Info). For UALR - the ability to add any needed terms to the MSHG and to (effortlessly) incorporate the corresponding links into course materials. For the students - an opportunity to learn more about topics they would not otherwise be able to explore as well as a chance to collate, process and present technical information to a diverse and multicultural audience. For ILPI - more and better content provides more site traffic, visibility and (eventually) revenue. An appropriate agreement outlining the intellectual property (IP) considerations of this effort was established before the collaboration took place. The IP agreement addressed the issue of the new content creation; those who merely link to the MSHG in their course materials have no authorship/copyright issues to confront. In the fall of 2005, several UALR pre-med students took an independent study course in which they created content for the MSHG. The pre-med students were given a list of terms associated with MSDSs and required to write hyperglossary definitions for those terms. Interaction between and within ILPI and UALR was ensured by setting up a class listserver to which students submitted their work and by holding weekly telephone conference call in which all participants discussed the week's submissions. After each phone or email discussion, the students then revised their drafts if necessary. The student's entries were added to the MSHG once the work emerged from the iterative submission/review/feedback process. In the latter part of the semseter, the students prepared and and presented a poster presentation on their work at the 221st ACS National meeting. In fact,Figure 1 is from the students' ACS poster. Figure 3 presents the learning outcomes in the students' own words. o One benefit of this project was learning to use the internet to develop factual and relevant content for unfamiliar terminology. Initially, research involved accessing online dictionaries, encyclopedias and wikipedias to quickly find basic information on the terms, and then summarizing that information into key points for the data sheets. Through using this approach for content creation, I soon realized that although I was able to define the word, I wasn't developing my understanding of how the term relates to chemical safety or the best way to convey safety information to the average user. o I began looking for articles in scientific journals for real world applications of terms such as non-immunological or TDLo. By bypassing the dictionaries, I could see how people are really affected if proper safety is not maintained. This knowledge vastly improved my ability to prepare relevant content for the MSDS Hyperglossary, especially the MSDS Relevance section. Figure 3. Student comments on the challenge of creating entries for the MSHG. In addition to the valuable experience of presenting at a professional conference, the students also had the pleasure of seeing work they had helped create become almost instantly popular on the Internet. Just two weeks after posting, many of the student-created entries rose quite high in Google rankings. For example, diuretic was 14 out of 2,140,000 matches, myalgia was 24 out of 778,000 matches, air force instruction was 4 out of 20,000,000 matches, paresthesias was 11 out of 217,000 matches, and IUPAC was 49 out of 2,080,000 matches! 7. Students learned how to obtain chemical safety information from the Internet. 8. Students learned how to identify valid information and how to establish a hierarchy of authoritative/reliable source materials. 9. Students learned to create and communicate scientific information to a diverse audience with a wide variety of educational backgrounds, from Ph.D's and MD's to janitors and shop room mechanics. The students really "turned on" to the idea of being able to codify and communicate technical information. Although this is a direct consequence of the open nature of the Web, it is also of great value to our future doctors and medical professionals, who need to be able to communicate with anyone who walks in their door. Safety is an integral component of any physical science laboratory program. In the UALR chemistry program the very first section of our General Chemistry laboratory manual is devoted to "Laboratory Etiquette and Safety Rules" and consists of 29 rules and a 25 question safety quiz. During the first lab session the students watch an ACS video on lab safety and fill out the "safety quiz". In addition, the instructors review the rules with the students and familiarize them with the laboratory and safety facilities. Each laboratory experiment starts with a section on "safety considerations" and the MSDS's for all chemicals used in the lab are kept in a loose-leaf notebook located in the adjacent prep room. While safety is maintained by minimizing risk to students through administrative and engineering controls, prior to the Spring 2006 semester safety was not explicitly integrated into the pedagogic goals of our lab activities. In this respect, prior to Spring 2006 our laboratory program treated safety in a very traditional manner. Having recognized the need to inculcate students with the concept of safety as an underlying research principle, we began our efforts by creating a series of web-based MSDS search activities and providing some simple instructions. We added a section on MSDS content to the lab manual (Figure 4) and then ran a series of online take home quizzes that utilized web-based resources that included the MSDS HyperGlossary, among others (Figure 5). At the end of the semester we also added an MSDS search section to the proctored computer component of the lab practical which utilized these resources. Figure 4. UALR written laboratory manual section on Material Safety Data Sheets. This activity was undertaken only in Belford's lab section as the instructor of the other other section felt that the traditional safety quiz at the beginning of class was adequate. Thus, the students who participated in this exercise were performing work that was not required of the students in the other sections. 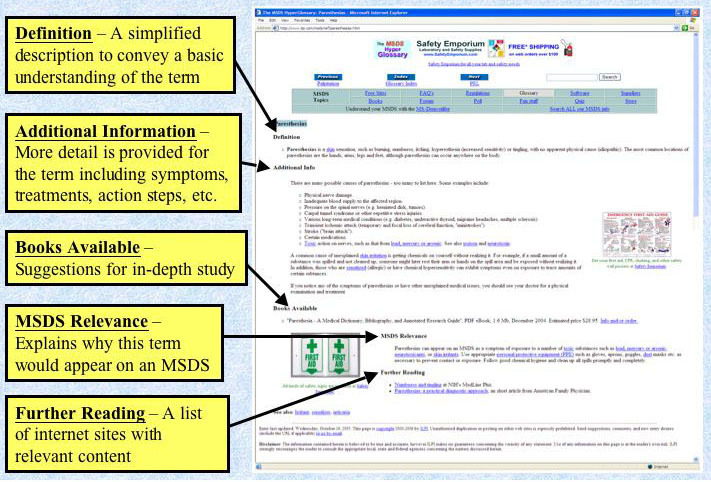 In the example shown in Figure 5, the students had access to both the Mallinckrodt Baker web siteand the MS-DeMystifier from the Class Chemical Safety Index Page. Although they were given a specific product number (3227 for solid KMnO4), one student looked up a 1.0N solution (product number 4677) which gave the opposite answer for question 3! This mistake lead to a very interesting and informative discussion. Thus, through these activities students not only learned how to become familiar with the sections and content of an MSDS sheet and how to quickly understand new terms like LD50, but also, the open nature of the assignment allowed them to make mistakes and learn from them without being exposed to any hazards. After the second assignment, we administered a voluntary anonymous survey with five questions (Figure 6). In response to question number 2, every student felt the online safety quizzes did more to enhance their perception of the dangers associated with chemicals than the traditional safety statements in the laboratory manual. The majority of the students used the MS-Demystifier to interpret MSDS sheets even though none had never used a hyperglossary before; 44% had previously used a wiki. Figure 6. Annotated results of the student survey concerning online safety quizzes. View a larger version of this figure. There were two open response questions in the survey. The first question dealt with student perceptions on the need to teach safety in a lab and the role a web based assignment could perform in a laboratory. The question and sample responses are shown in Figure 7. Why should a freshman chemistry course teach students about web-based chemical safety resources lke MSDS's? o "For numerous reasons, but the main one being for the student to know how to be educated about how to respond if something dangerous happens with the chemicals that they will be using in a laboratory experiment. Also, if the student is planning on furthering his or her education in the science field, then knowing how to use web based chemical safety resources will be helpful knowledge. This would be true especially in the more advanced science courses where more analytical thinking is required." o "Helps to gain knowledge of the chemicals we are using and also the reference tools on the web that we have available to us. Gets those of us that may need such tools prepared and acquainted." o "I believe it is an excellent learning tool on informing students on the dangers associated with the chemicals that we will be working with." o "The online safety quizzes are helpful in that they are not as general as the generic safety quiz. The safety quizzes deal with specific elements that are used in a certain lab." Figure 7. Student responses to a survey question dealing with their perceptions of web-based safety resources used in their class section. The second open response question in the survey dealt with student thoughts on the online safety quizzes (Figure 8). Their responses indicated that the students thought the assignment was worthwhile. Perhaps more notably, no totally negative comments were received in the survey. Several of the students did not approve of having to do more work than the other lab section, but they all backed that up with a statement saying that the small burden was outweighed by their perceived benefit of the assignments. o "I personally thought they were a good idea. It's not very hard to complete and it is a good way to learn about chemicals and their dangers and reactivities and properties.Some people don't even read or come to lab prepared unless you make them and this is a great way to do so, both for knowledge and safety." o "I actually appreciate them very much. As a pharmacy technician in a hospital, our MSDS manuals include over 5,000 chemical substances. Moreover, the majority of those substance are found in the pharmacy. I remember during my orientation the emphasis the hospital placed on knowing where the MSDS manuals were located in our department, but that does little to explain the importance of the MSDS sheets contained in the manuals. Therefore, I now know what is contained on the MSDS sheets and what information can be obtained from them. It certainly makes using the chemicals more interesting if you know their potentials." o "I think that the online safety quizzes are a good idea, but the workload of the student should be considered when assigning them. i.e. don't assign lots of other work when assigning the safety quizzes. Too many assignments can diminish the student's performance on a single assignment." o "Safety quizzes is really a good idea for us to learn more about CHEM. I believe it is an excellent learning tool on informing students on the dangers associated with the chemicals that we will be working with." o "I think the online safety quizzes are more work, but the benefit of understanding what chemical we are dealing with and the dangers that could be associated with it outweigh the little bit of work involved. It forces us to at lest read it once to understand what we are dealing with, and that is a very, very good thing." o "I found them to be a little overwhelming because I have 18 hrs and a lot of equally challenging courses as this one this semester, but I think they are a good way to help students understand chemicals better, as well as introduce new techniques in gathering information." Figure 8. Student responses to an open-ended question on the efficacy of the web-based safety quizzes. Emphasis added. One of the biggest surprises to emerge from the incorporation of web-based safety materials into the general chemistry course is that the web-based safety activities made the students more interested in learning chemistry. UALR is a public institution and significant fraction of the students enrolled in second semester general chemistry are taking it as an obligatory requirement of their non-chemistry degree programs. As we know all too well, student motivation in required service courses is a considerable challenge and one might have predicted that the "extra" work would have a negative effect on student satisfaction. Clearly, the web-enhanced MSDS exercise helped the students to see relevance to their personal lives and this exerted a positive motivational effect. While some students indicated that they did not like having "extra" work versus the other sections, these respondees unanimously felt the extra work was worthwhile. A very simple way around the "more work" issue is to ensure that all course sections have identical requirements. If aligning every course section in this way is not practical or desired, another way to ameliorate the perception of a greater workload would be to award extra bonus points to students who participated in the web-based component. An unexpected but clear benefit of the web-based MSDS exercise is that students saw firsthand the shortcoming of an MSDS. This is an important lesson. Consistent with the scientific and Socratic methods, we do not want students to believe everything they read, even if it is published in a scientific journal. Healthy skepticism is even more important when students seek information from non-peer-reviewed resources like the Internet (in chemistry or any other topic, for that matter). In fact, a wily instructor might deliberately create an assignment in which two "authoritative" resources conflict. Seeing that two MSDS sheets from the same reputable manufacturer had contradictory first aid instructions depending on the concentration led to some very interesting discussion. In fact, this question was rephrased and sent to the ACS Division of Chemical Health and Safety's (DCHAS) listserver. It was noted that the MSDS for solid potassium permanganate states not to induce vomiting while that for 0.1N says to induce vomiting. So, if one purchases a solid and makes a 0.1 N solution, what MSDS should you keep on file or refer to in an emergency? Even the members of the DCHAS discussion list could not come to a consensus! Clearly, the MS-Demystifier was instrumental to the success of the general chemistry assignments. Students loved having the ability to paste a document into the Demystifier and having the terms automatically hyperlinked to the hyperglossary, facilitating their ability to comprehend the content. Just as the Demystifier lowers barriers to student learning, it also lowers the barrier to incorporation of the MSDS HyperGlossary into laboratory or classroom curricula. An instructor does not need to manually insert hyperlinks to the MSHG (but this is trivial to do, of course). He or she can instead simply run their web page source code through the Demystifier and instantly leverage the power of the Hyperglossary with zero additional effort. And because the MSHG is written to be comprehensible to a diverse audience, instructors at all levels - midde school, high school, college, or even graduate - can avail themselves to this approach. An immediate future direction of this work is therefore to include MSDS HyperGlossary links in all relevant course materials such as laboratory assignments, handouts, and manuals. Based on prior experience using a hyperlink-integrated theme in a senior level Inorganic laboratory (Toreki, More Info), we suspect this approach will be quite successful at inculcating students in a culture of safety, increasing their positive perceptions of the course, and promoting an improved pedagogical outcome. While a few years ago many students may have been put off by the web or following hyperlinks, students today are incredibly adept at thinking and manuevering in web-based paradigms (witness the popularity of web-based course adjuncts in general, electronic homework etc.). We must work to reach students in this familiar medium. In the longer term, we would like to see instructors at other universities pick up on this approach, which is zero-cost and has a very low activation barrier to implementation thanks to the combination of the MSHG and MS-Demystifier. We are happy to assist anyone who is interested in exploring such possibilities. Copyright 2006 by Robert Toreki and Robert Belford. Unauthorized posting or reproduction is strictly probhibited. All rights reserved. Revision date: 22-Jun-06, 22:10. Views since 25-Jun 23:40: 2054.